In many ways New Super Mario Bros. was the original Super Mario Bros.—only more so. 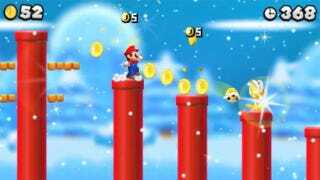 The levels and enemies were similar and even the new power-ups of Mega Mario and Micro Mario were just exaggerations of normal and Super Mario. In the same way, New Super Mario Bros. 2 is an homage to Super Mario Bros. 3. The koopa kids are back with their magic wands as is the raccoon suit. The world themes are often identical to Mario 3—e.g., World 1 is normal, World 2 is a desert, World 3 is water. All in all, it brings with it a welcome sense of nostalgia to anyone who spent countless hours with the NES classic. previous iterations, each level has three hidden medals to find and collect, and many levels have several exits that open up optional paths with optional levels. It's really easy. Because of the game's new focus on giving billions of coins—as exemplified by the new golden fire flower and golden enemies debuff—you will never be in the slightest danger of running out of lives. Besides a few notable exceptions, the levels themselves are pretty simple, with deaths likely to occur only because of the addition of a new element or a blind jump. Despite the game's average ease, there are one or two sudden difficulty spikes—usually involving a particularly tricky jump at the very end of a level. This of course means that every time you fail, you must go back to the world map, start the level again at the halfway point, and spend a minute or two getting back to the place where you failed. But why would I want to load back to the world map after each failure? What I want is to try again as quickly as possible, not to waste time loading. The worst example of this is the final boss. As all of his attacks are one-hit kills, a single mistake sends you back to the last check point—forcing you to beat his first form and then watch an unskippable cutscene before getting back to the part in which you died. It's just an aggravating waste of time. Make no mistake, New Super Mario Bros. 2 is a 2D side-scrolling Mario game. There are new power-ups, levels, enemies, and gameplay modes; but at its core, it's the same Mario experience you've had again and again since the NES. If you are looking for a new take on Mario, you'll be better off playing last year's Super Mario 3D Land. If, on the other hand, you are looking to relive the glory days of the NES with a re-imagining of Mario 3, this will certainly be a game you'll enjoy. New Super Mario Bros. 2 was released on the 3DS in Japan on July 28, 2012. It will be released in North America on August 19, 2012.